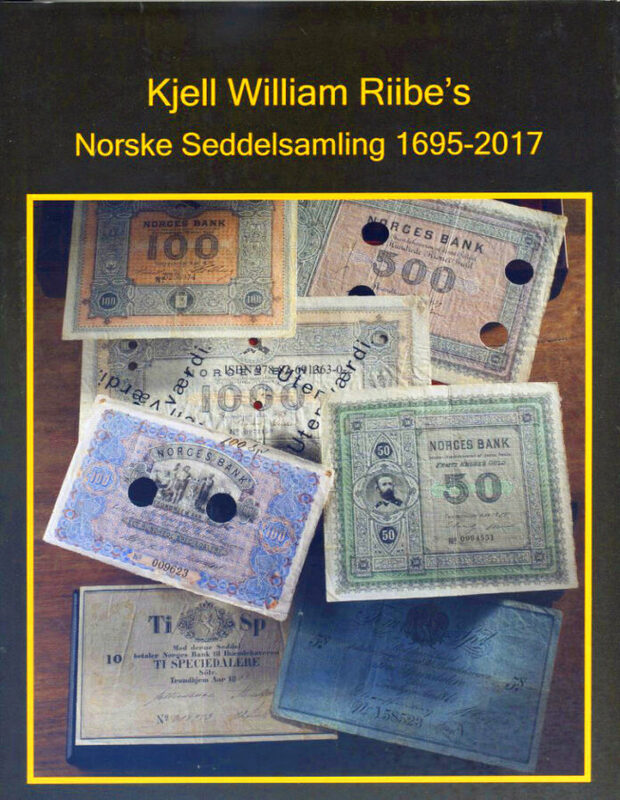 Kjell William Riibe, Norske Seddelsamling / Norwegian banknotes collection 1695-2017. Self-publishing company 2018. 904 pp., fully illustrated in color. Hardcover. 22.5 x 28 cm. ISBN: 978-82-691363-0-2. 1,290 NOK (ca. 133 euros). If you decide to become a coin dealer, you usually don’t do it because you want to become rich. You become a coin dealer because your own love of numismatics leaves you with no other choice. A prime example of this claim is Kjell William Riibe who published his collection of Norwegian banknotes in a monumental catalog in 2018. The book’s weight alone will earn the readers’ respect. Its 903 pages and 3,502 numbers make for a gigantic work which will from now on be a standard reference work for Norwegian banknotes between 1807 and 1900. Those were the issues the collector focused on. More recent issues of paper money – up until the new millennium – are, of course, also listed in the catalog. However, the collector did not strive for completeness in that section. According to Kjell William Riibe himself, he spent more than 80,000 hours on the acquisition of the largest collection of Norwegian banknotes ever to be compiled. He began doing so when he realized how rare Norwegian paper money really is. It’s not like his position as one of the most important Norwegian coin dealers would have helped him in his collection endeavor! Throughout all those years, potential sellers only brought three(!) banknotes from the 1816 to 1877 period and five(!) banknotes of King Oscar to his store. He hunted for all the other objects himself. He went looking for the most important private collectors in order to buy their collections. He travelled around the world so he could bid in all auctions that offered Norwegian banknotes. He emerged victorious from those bidding wars as no one else was willing to pay as much money for those great rarities as Kjell William Riibe. Browsing the catalog makes you understand that his tenacity paid off. You’ll read the phrase “UNIK I privat eie” so often that even if you don’t speak Norwegian, you’ll soon understand that it translates to “unique, in private possession”. The prices of every single piece indicated by Kjell William Riibe are his own estimates – the estimates of a very experienced, but nevertheless still enthusiastic collector. In the book’s preface, he himself says that in an auction, those estimates may well be exceeded or fall below. Nevertheless, they constitute an excellent reference point as to how to evaluate the pieces. As the estimates are given in Norwegian Kroner, it is fairly easy to convert them into euros. You simply have to cross out the last zero. Both sides of every single object from the Riibe Collection are depicted in color. In addition, the denomination, year of issue, place of issue, the banknote’s number, its provenance, a quote and the piece’s quality are all indicated. Readers might miss an introduction on monetary history and a more detailed description of the banknotes. However, the author does explain in the preface why he decided to publish the book now, without having achieved the perfection he had initially aimed for: just when he began working on the last changes and amendments, he was diagnosed with cancer. An ulcer was removed from his back, which left Kjell William Riibe partially paralyzed. His recovery took five months. Afterwards, the collector felt it incredibly important to publish his life’s work – even if the catalog did not achieve the ultimate perfection the collector had had in mind (which most users will probably not even notice). And this is how we ended up with this important catalog of Norwegian banknotes. The preface tells us that there are other parts of the Riibe Collection he also wants to publish in a book: the banknotes of Sweden, Denmark, Iceland, Greenland, the Faroe Islands and the Danish West Indies. As the daughter of a father who lived happily and actively for another 34 years after being diagnosed with gastric cancer and having his stomach removed, I sincerely hope that the author Kjell William Riibe will be as lucky as my father was. And I hope that the numismatic collectors’ world will be able to read all of the other six catalogs penned by the same author. You can order the catalog on the Riibe Mynthandel website. Riibe Mynthandel’s online shop offers about 180,000 lots, which is quite a treasure chest for collectors of coins and banknotes of the Scandinavian countries. An updated and revised sixth edition of Whitman’s Guide Book of United States Paper Money is available now. The new book is a history and price guide of the paper currency of the United States dating from Civil War federal issues to present-day cash, plus related issues.